Less than a week after Apple announced plans to ditch both its pro-level Aperture and consumer-minded iPhoto photography tools for OS X, a report on Tuesday offers additional details on the upcoming replacement app, Photos for OS X. 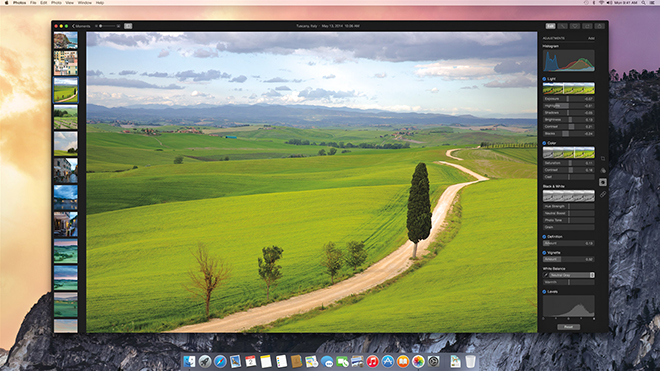 Last Friday, Apple revealed it has ceased development of Aperture and iPhoto in favor of "Photos for OS X," which is set to debut in 2015 as an accompaniment to the next-generation OS X 10.10 Yosemite operating system. At the time, little was known about Photos aside from a brief onstage mention at WWDC and a screenshot that shows a user interface and toolset befitting of a "prosumer" title. On Tuesday, Apple revealed a bit more background on the upcoming app, telling Ars Technica that Aperture-level features will be built into the title at launch, including image search, editing, effects and third-party extensibility, or plugins. As seen in the above screenshot provided by Apple, Photos for OS X will be an in-between product, blurring the line between consumer and professional-grade image editing and management software. For example, while image adjustments like saturation, temperature and contrast exist in iPhoto, the upcoming Photos app appears to have a higher level of control ala Aperture. The most enticing promise, however, is third-party extensibility, which could potentially bring advanced customization options that users can apply to tailor Photos to their specific needs. If developers take to Apple's software, the app may one day offer an image editing framework robust and powerful enough to rival true pro-level tools. That being said, it looks as though out-of-the-box functionality will be somewhere between iPhoto and Aperture, as Apple alluded to in its previous statement. As for current Aperture users, Apple said it will roll out a final update to bring compatibility with OS X Yosemite, but there are no plans to continue software development beyond that point. To ease the transition, the company is working on a solution to streamline image transfers from Aperture to Photos for OS X, which will likely to built into the forthcoming title. Interestingly, Apple also mentioned it is concurrently working on a transitionary workflow from Aperture to Adobe's Lightroom, suggesting Photos may not fit the needs of photography professionals.